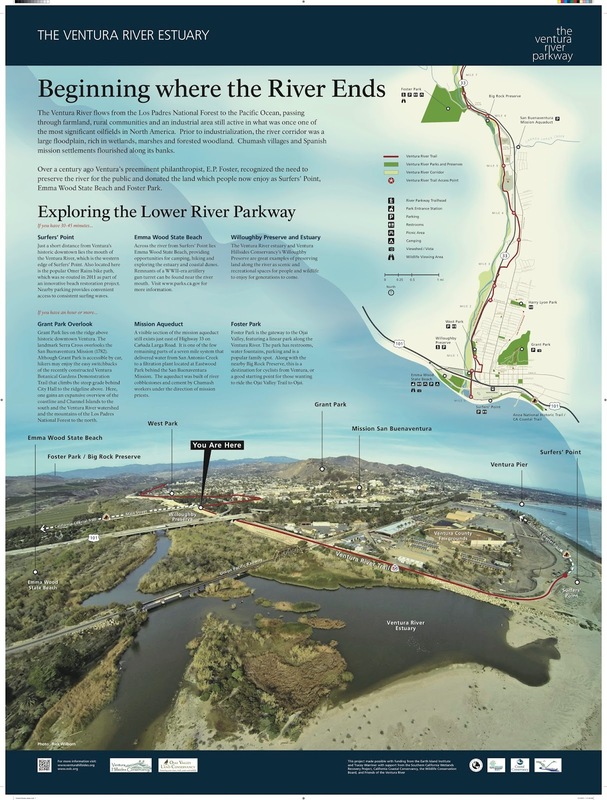 The Ventura Hillside Conservancy in partnership with the Friends of the Ventura River installed an interpretive sign near the Main Street Bridge to promote the Ventura River Parkway. The Ventura River Parkway is a long-term solution to ongoing threats to water quality and habitat in our local watershed. 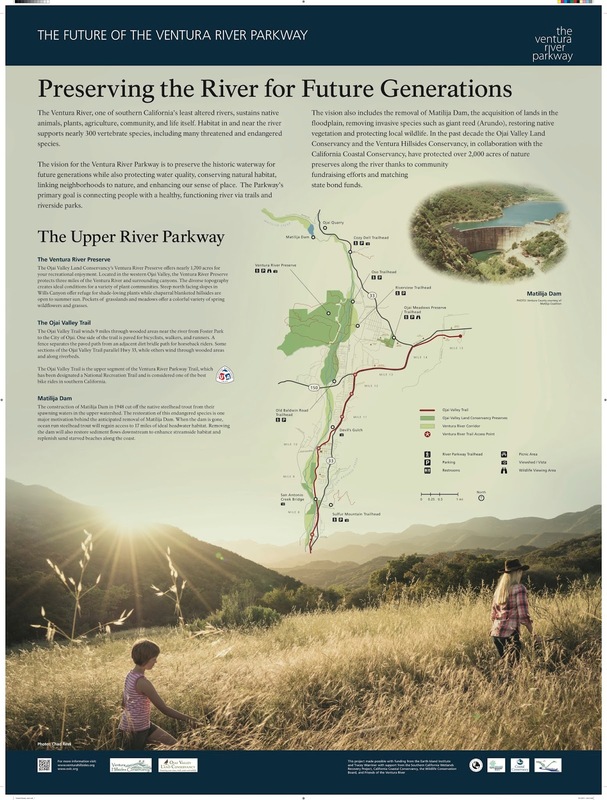 The growing network of trails and parks will reconnect the community with the river and transform it into an asset for all to enjoy. This project was made possible with funding from the Earth Island Institute and Tracey Warriner with support from the Southern California Wetlands Recovery Project, California Coastal Conservancy, the Wildlife Conservation Board. 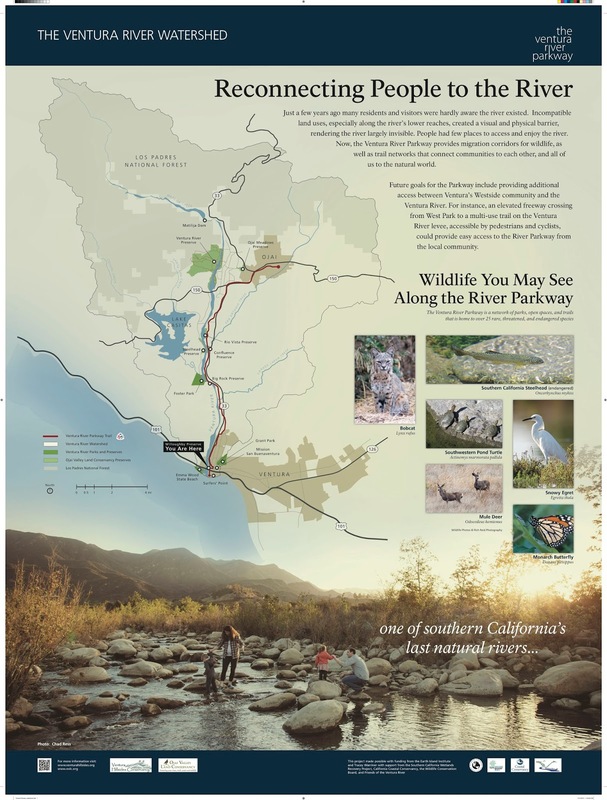 Friends of the Ventura River sponsored the design and photography with support from Patagonia. phenomena termed "wave setup" and "wave runup," produced large surges of water causing unprecedented coastal flooding in Ventura. The photo below shows that although the seaward edge of the dunes was eroded, overtopping was kept to a minimum. The loss of the seaward edge of these dunes was expected, and they will grow back during the summer months. This illustrates the value of "retreat." Allowing space for the beach, dunes, and cobble to come and go naturally is a welcome change from the crumbling asphalt and concrete that were removed from this site. The photos below are shown to illustrate the difference between the Managed Retreat project area and the parking lot that remains until Phase 2 is funded. Although there was no damage to the bike path and parking lot this time, the entire area got wet with overtopping waves. The following sequence illustrates the function of the buried cobble berm. The summer waves bring sand back to the beach every year, completely burying the exposed edge of the cobble berm. Winter swells remove this sand and expose the cobble beneath. The cobble naturally forms a berm which is very effective at absorbing wave energy. 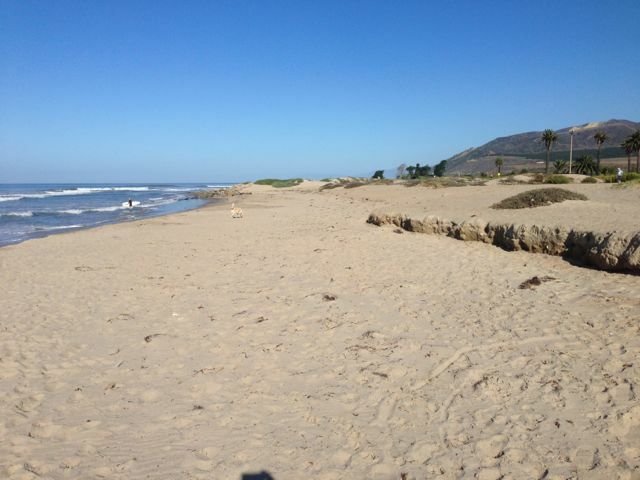 Note that this site is on the Ventura River Delta where cobble is a feature of the natural beach. Also note that the hard escarpment is a result of "sand" that was imported from an inland source during construction. Despite engineering specifications that limited the percentage of fine sediment in this material, there was enough fine silt and clay to firmly cement this layer. Erosion events like this will remove this fine material over time leaving a more natural sand and cobble beach. 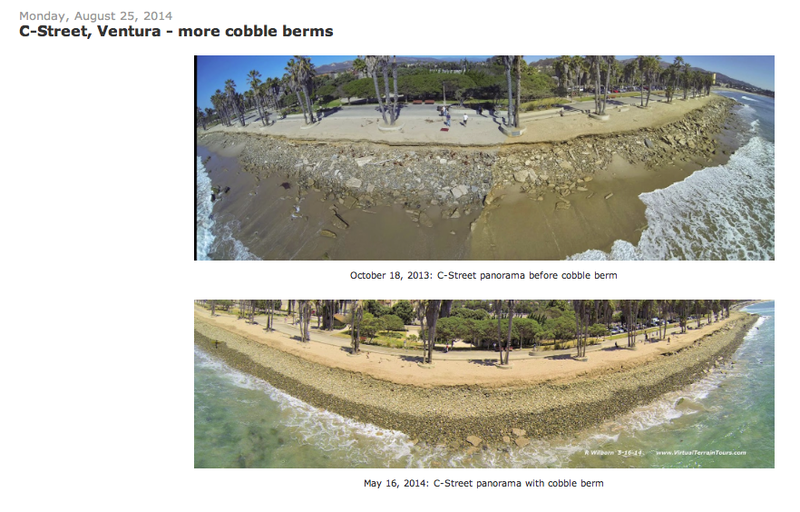 These next two photos show how much sand was removed during the large swell of December 11. Also compare the degree of overtopping during the high tide of December 2nd vs that of December 11. (Remember that this cobble berm will once again be buried in sand next summer.) The rocks in the right foreground are the "spur groin" on the end of the Ventura River levee. This structure focuses wave energy onto the cobble berm, which was the cause of greatest erosion prior to construction of the managed retreat project. It is also interesting to compare those areas with established dunes versus a flat beach. 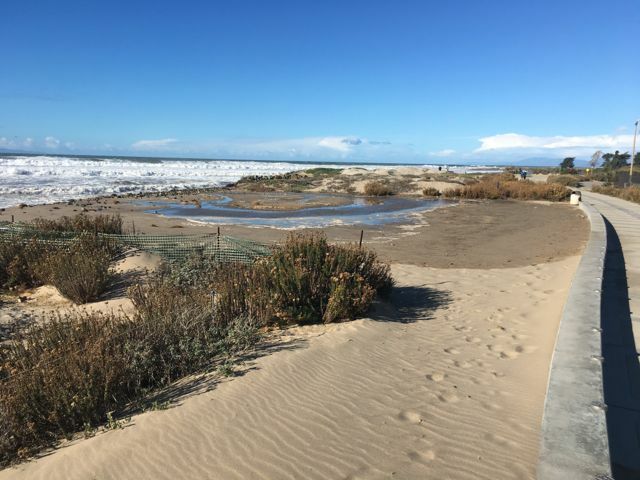 Although the dunes were slightly overtopped or wetted in the low spots, large surges of seawater completely flooded the recreation area used by kite boarders. (Note that this flat area was not part of the original plan, but was modified during construction. While this actually enhances this "living laboratory" opportunity, it is clearly the weak link in the project.) 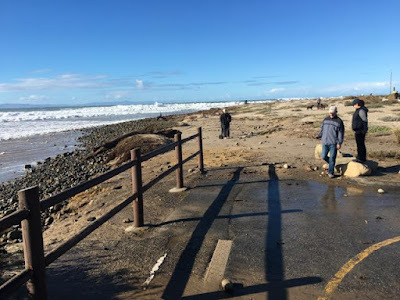 Also note the blown sand in the foreground of the second image: this is the only location where sand is not captured by vegetation, often resulting in sand blown onto the bike path. 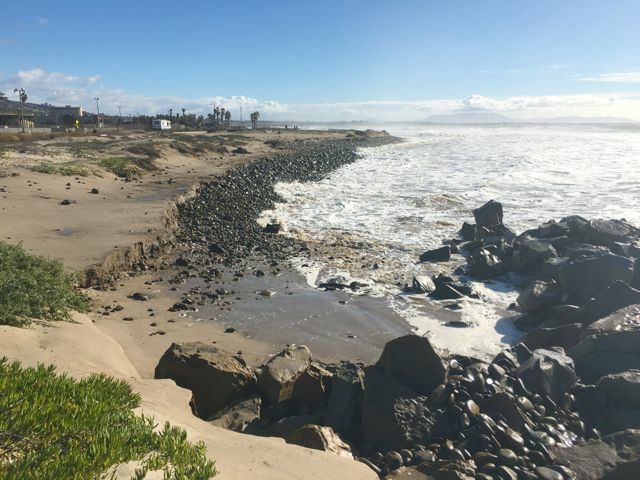 The Surfers Point Managed Shoreline Retreat project performed as designed during the first significant swell since construction. We shall continue to maintain and monitor the site to demonstrate the advantages to this approach to coastal management compared to the hard structures of traditional coastal engineering. Special thanks to all the partner agencies who made this project possible! 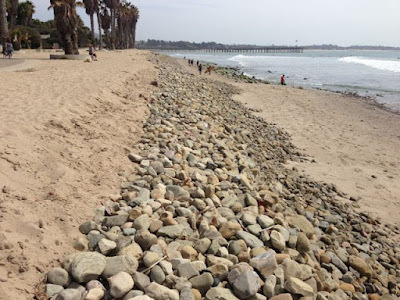 In February 2014, the City of Ventura constructed a cobble berm to protect the public amenities along the promenade and bike path in Ventura. 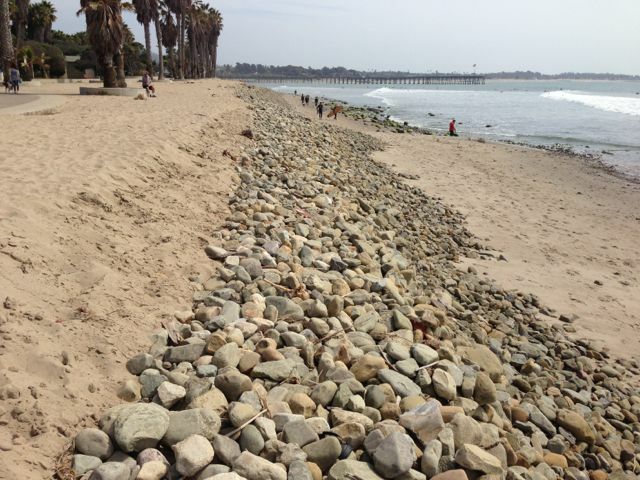 Surfrider documented this project, and noted the rapid migration of the imported river rocks along the shoreline. On December 11, 2015, a large westerly swell flooded the Pierpont neighborhood and damaged the Ventura pier. Not surprisingly, one of the palm tree planters along the promenade at C-St collapsed into the surf. 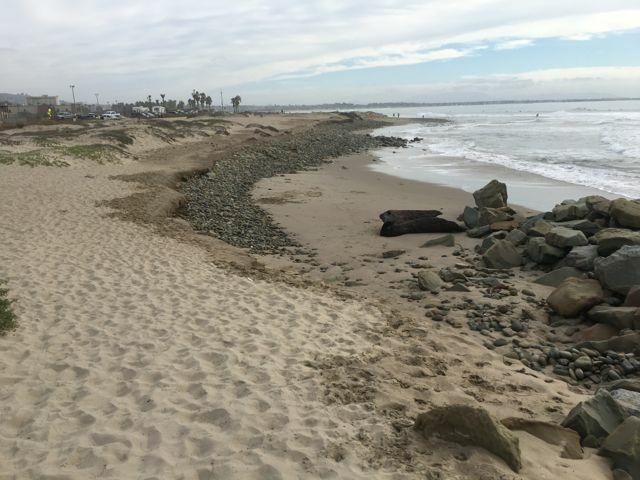 Surfrider had contacted the City in October when it was evident that the planter was at risk. Apparently others had expressed the same concern. 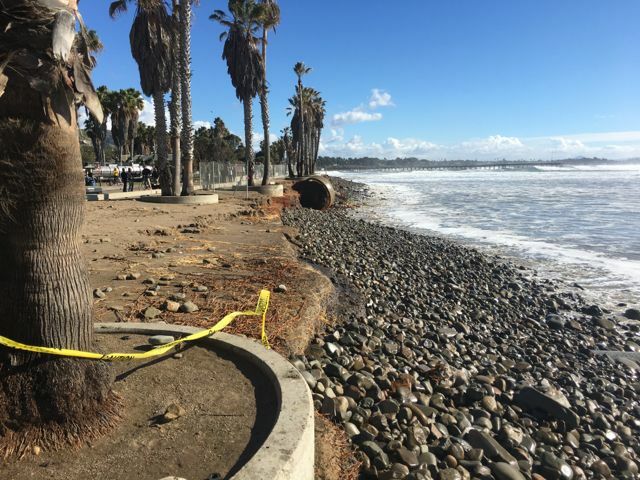 As a result of public concern for the palm trees, Ventura City Council approved "emergency funding" to renourish the cobble berm. Unfortunately the funding approval came too late, and re-nourishment is not expected until after the new year. It is evident from our monitoring and these images that much of the cobble migrated down into the cove. 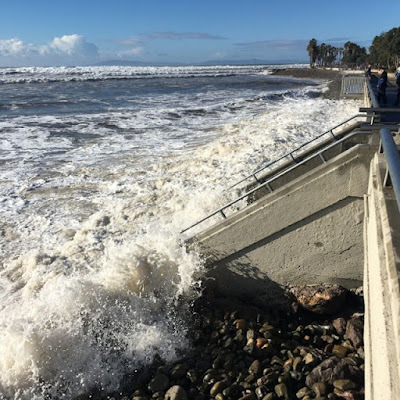 A significant berm formed during recent winter swells in front of the promenade stairs. This berm provided protection for the stairs that have suffered damage in past winters. 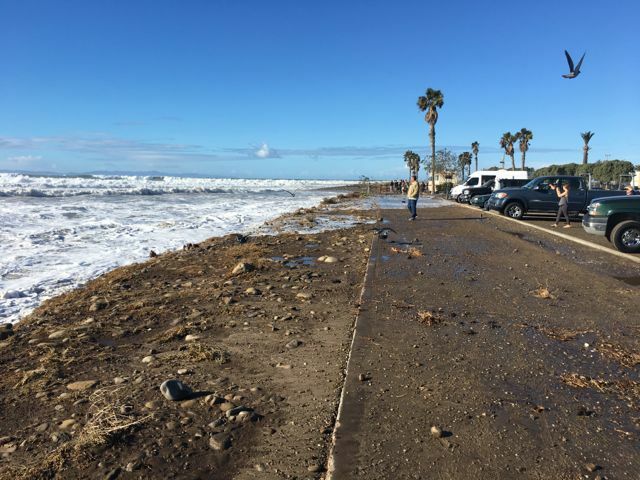 So although the cobble nourishment did not protect the palm trees during this largest swell in recent history, it did provide a benefit to the promenade just downcoast. 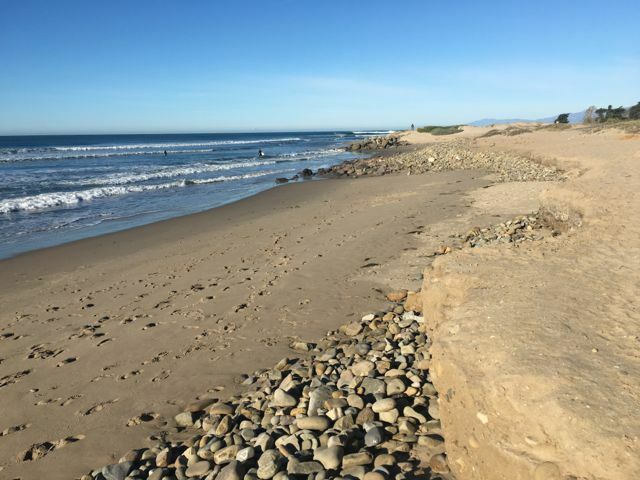 The city has a Coastal Commission permit for ongoing nourishment along Surfers Point. Although the one-time nourishment done in 2014 did not provide the anticipated level of protection, regular nourishment would progressively add volumes of cobble for more protection. Although it is tempting to call for a more permanent revetment to protect the palm trees along the promenade, this would have other impacts. 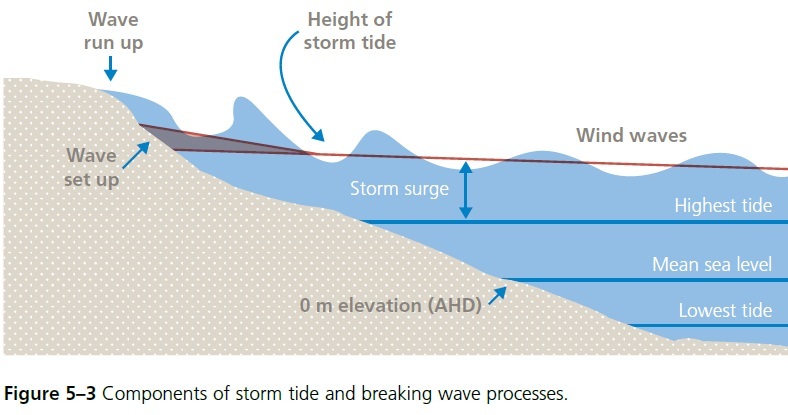 Coastal structures exacerbate erosion downcoast. They also disrupt coastal processes and recreational access to the beach. 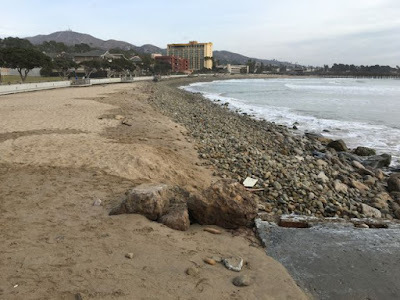 Surfrider recommends that the City of Ventura establish a permanent budget for beach maintenance with oversight by a qualified coastal engineer. Regular monitoring and renourishment is necessary to maintain a beach to protect the promenade in its current location. We also recommend that the strict engineering specifications for constructing a cobble berm be waived in favor of a less expensive and more frequent nourishment. 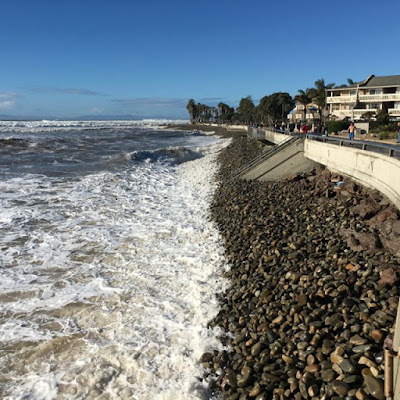 It was clear during construction that the waves quickly re-worked the carefully graded cobble berm, undoing thousands of dollars of work in a matter of hours. A more efficient use of funds may be to simply dump smaller quantities of cobble in an easily accessible location and allow the ocean to work it into a berm. It may also be beneficial to consider implementing Phase 2 of the Surfers Point Managed Shoreline Retreat project as envisioned. The additional large quantity of sand and cobble would ultimately benefit the downcoast beach. However, this would not eliminate the root cause of the problem. 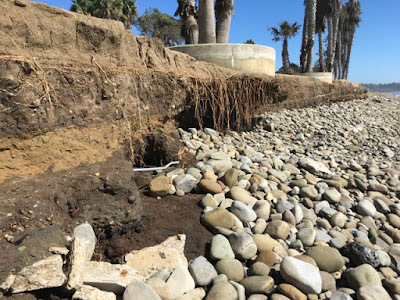 The root cause of the erosion problem is infrastructure built too close to a shoreline that is receding due to rising sea levels and a sediment deficit. 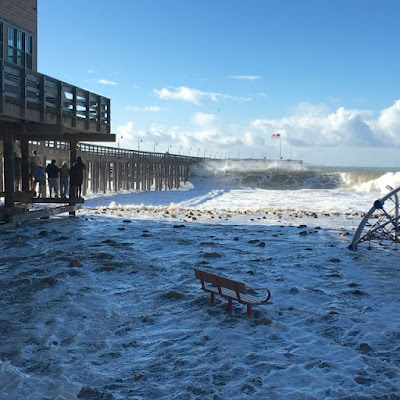 There's not much that can be done locally to combat rising seas, but it is noteworthy that record tides up to one foot above the predicted high tide have been recorded this year due to the warm water in the Pacific Ocean. The current sediment deficit is the result of the long-term drought. Indeed, the erosion which damaged the then-recently constructed bike path in 1991-1992 occurred during the last major drought. This year's much-anticipated el nino floods, if equivalent to the big events in the past, will deliver a large quantity of sand and cobble to the river mouth. This sediment will naturally fill in along the point providing a benefit for many years. 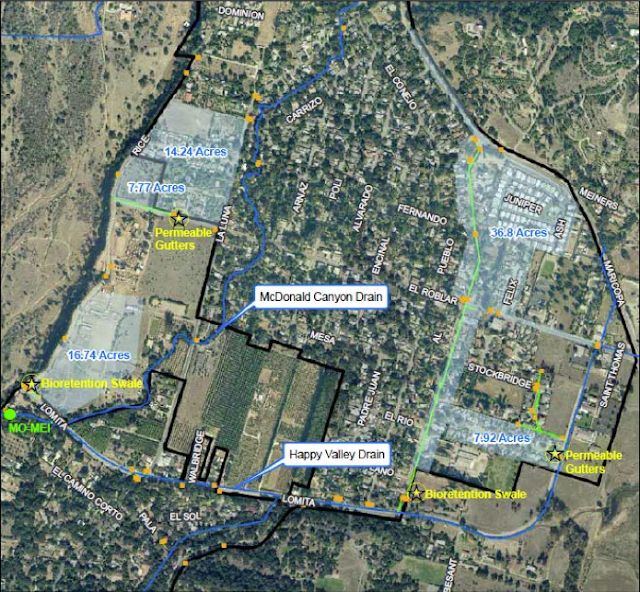 Of course, the ultimate long-term solution is the restoration of the Ventura River through the removal of Matilija Dam. This project is necessary for many reasons, but it was beach erosion that kicked off the first studies in 1998. 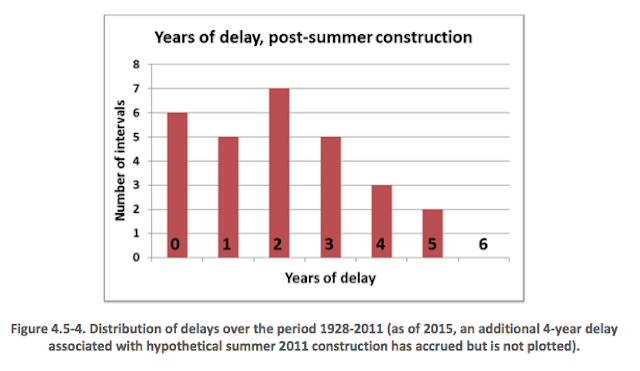 Much progress has been made on that project, but funding remains a major hurdle. It is unfortunate that the city of Ventura has opted for a “hard solution” to coastal erosion at Surfers Point following the loss of a palm tree along the promenade. Indeed it’s ironic since the city was a strong proponent of the highly successful “managed shoreline retreat” project on the adjacent section of the point managed by the Fairgrounds. It’s also disappointing considering that they have a standing permit to renourish the beach with sand and cobble, but have been unable or unwilling to dedicate funding to maintain Ventura’s greatest asset. Indeed, intentional neglect is a useful strategy used to invoke the “emergency” loophole in the California Coastal Act. 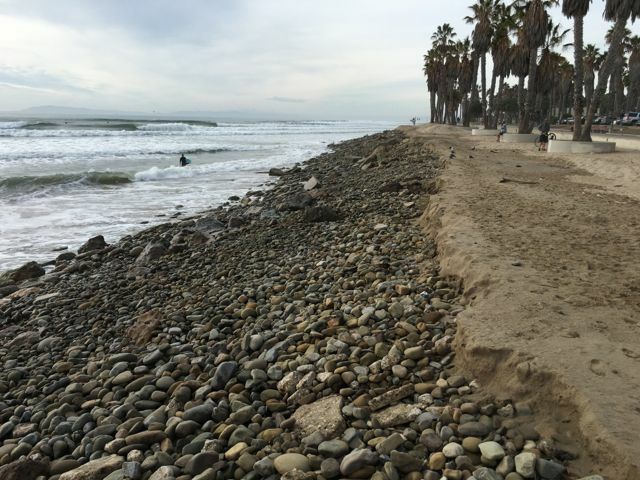 Beachgoers will soon have to negotiate “a 265-linear-foot rock revetment, approximately 15 feet tall and 30 feet wide, consisting of approximately 1-3-ton stones.” And it will not be long before the erosion caused by this new structure will necessitate even more rocks, forever changing Ventura’s famed “C Street” surf break. 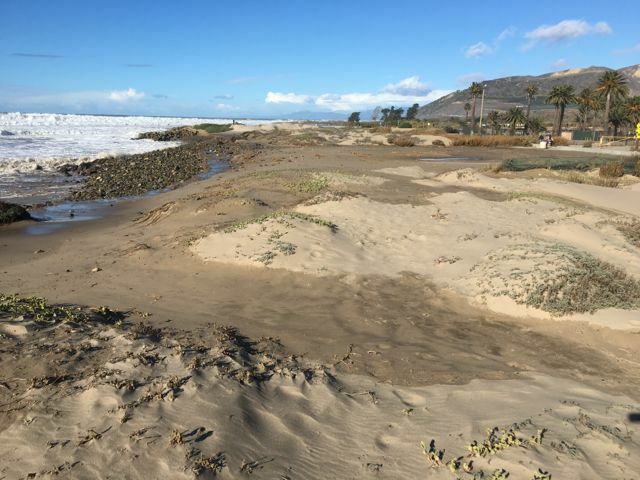 Following much discussion, the City of Ventura has decided to exercise their right to the Emergency Permit issued by the California Coastal Commission. 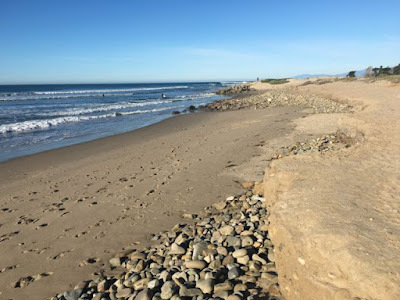 Surfrider expressed concerns that a rock revetment will exacerbate downcoast erosion, perhaps leading to additional armoring in the future as well impacting the recreational beach. We also suggested that the event of December 11 was an extreme event, even in this round of El Nino storms and swells, and the loss of a palm tree did not constitute an immediate threat to the promenade. The revetment will be considered "temporary" until a Coastal Development Permit is issued by the commission. The City has indicated they will reevaluate the situation following the winter season and seek funding to assess their alternatives. 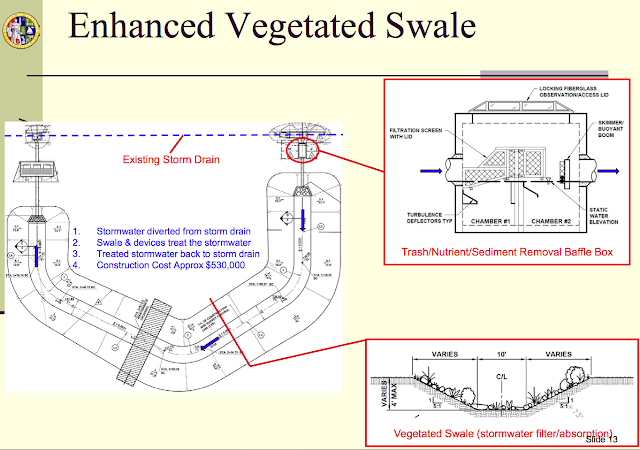 Surfrider shall monitor the effects of this structure and retain the right to appeal the final permit. As we prepare for 2016's predicted floods, it is interesting to look back in history. 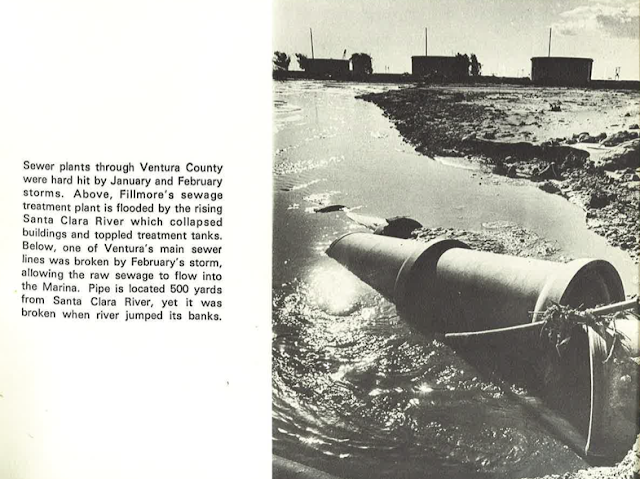 The photos below illustrate the impact to the City of Ventura's wastewater infrastructure from the big floods of 1969. The Santa Clara River jumped its banks and flowed around the wastewater treatment plant into the Ventura marina. 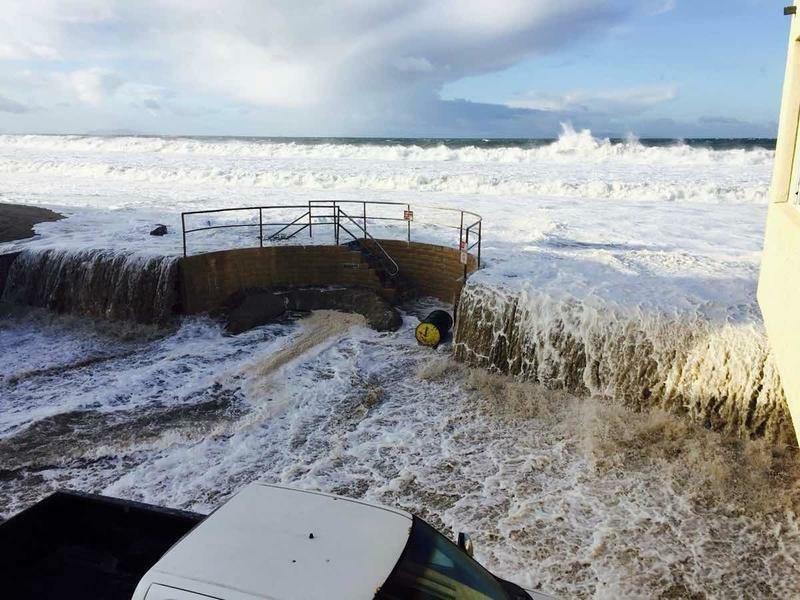 Broken pipes spilled raw sewage into the ocean for weeks. 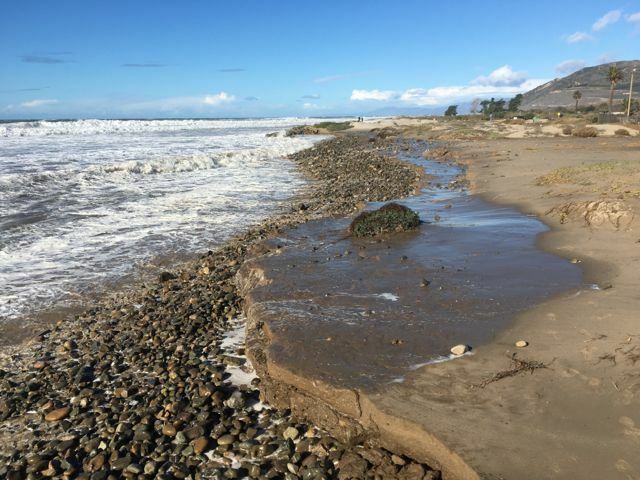 In many ways the wastewater treatment plant located at the mouth of the Santa Clara River continues to become increasingly vulnerable over time. Upstream development has led to new and bigger levees, effectively channelizing the river and increasing flows near the river mouth. Moreover, as time goes by climate change will compound the problem through increased storm intensity which will add to the threat of flood from upstream, while rising sea levels present a growing risk from the ocean. 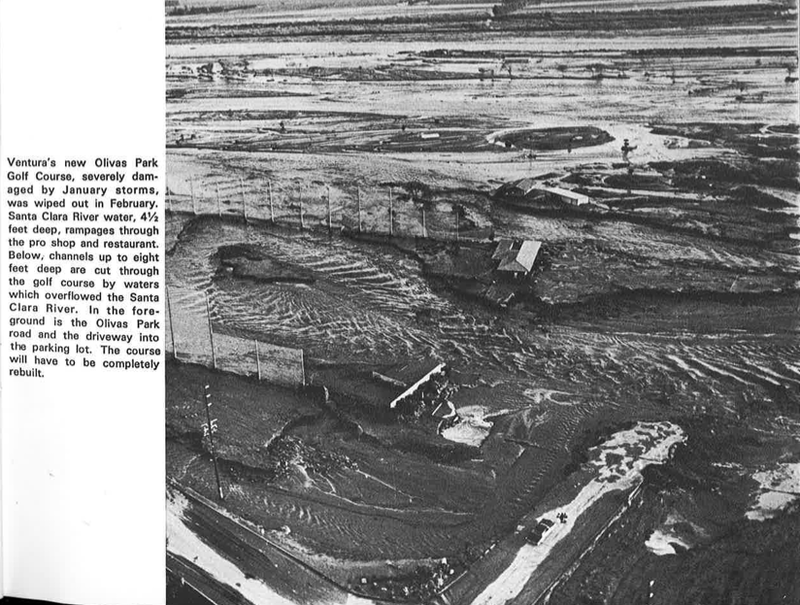 The Olivas Park golf course was historically a productive wetland, which also provided an effective buffer to flood waters along the banks of the Santa Clara River. 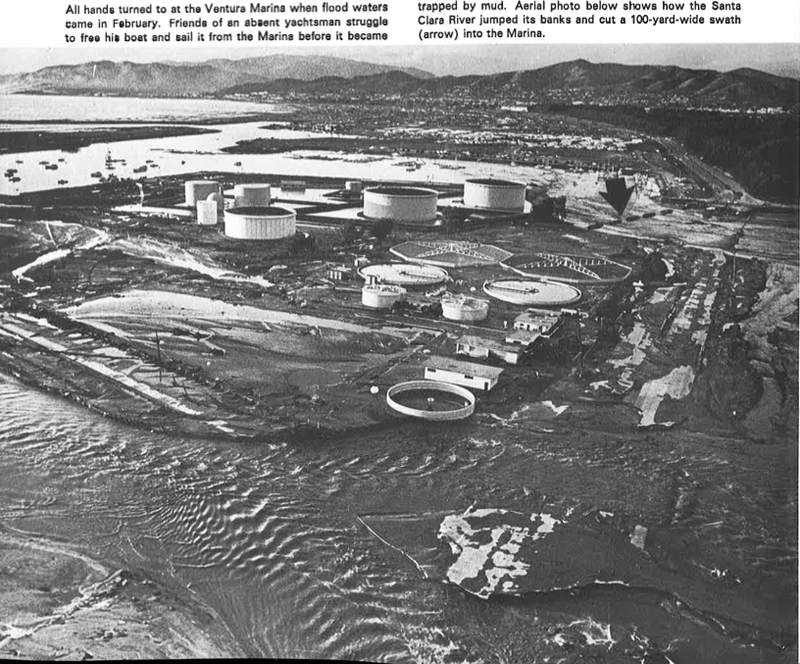 As illustrated below, in 1969 the river flowed right through the recently constructed golf course and into the marina. 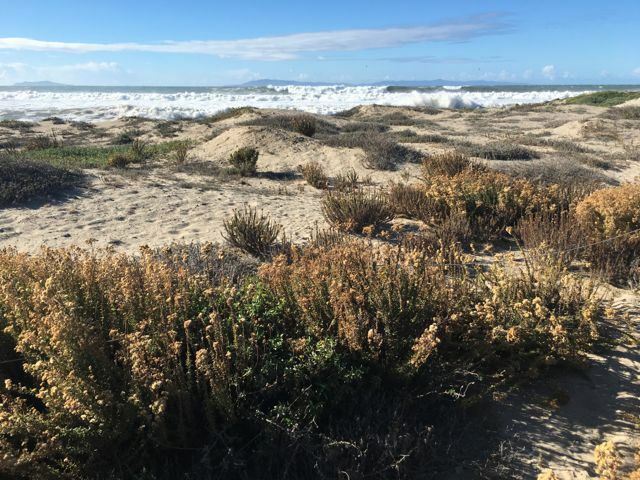 Solutions: Surfrider has commented on the Santa Clara Estuary Special Studies that Ventura Water should take advantage of ongoing plans to reduce discharges into the Santa Clara Estuary through wastewater recycling, and consider developing a decentralized strategy. This would over time reduce the volume of wastewater reaching the estuary, and increase resilience in the face of these risks. 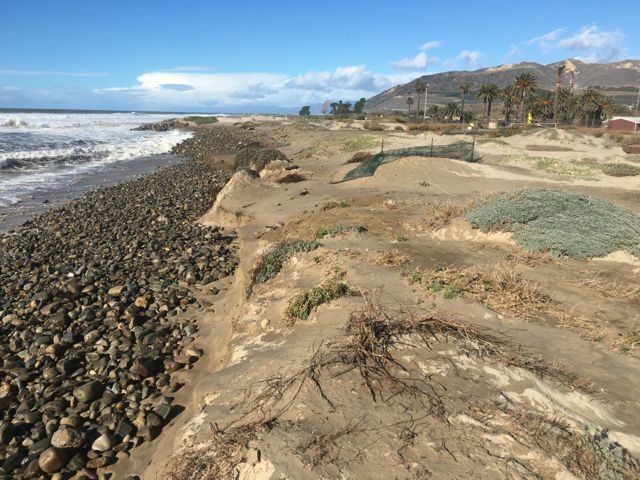 Coastal erosion has repeatedly damaged surfside bike paths and parking lots near Ventura, California. It took local groups with varying viewpoints more than a decade to agree upon a strategy, but the first phase of their solution is now complete. Surfers' Point serves as a case study in a recently published paper, “Factors Influencing Local Decisions to Use Habitats to Protect Coastal Communities from Hazards.” Researchers at Scripps Institute of Oceanography examined the processes by which three projects using "Natural Infrastructure"(NI) were implemented. 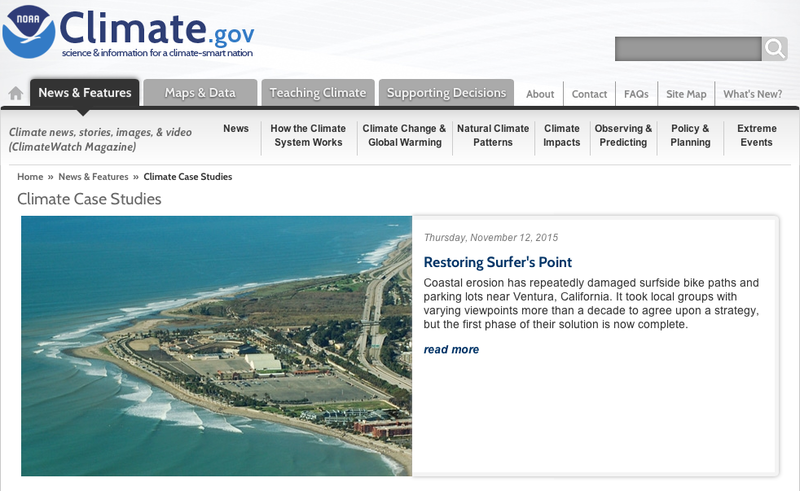 The complete document is available online at Ocean and Coastal Management. 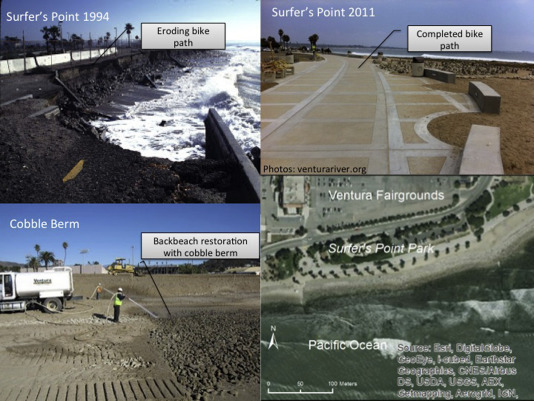 In all three cases, the recognition of a need to address shoreline erosion and associated coastal flood hazards was a starting point for the projects. Each project involved multiple stakeholders through formal and informal decision making processes. For instance, the design of each project involved engineers as well as stakeholders. Similarly, each process had to be permitted by local, state, and sometime federal agencies. 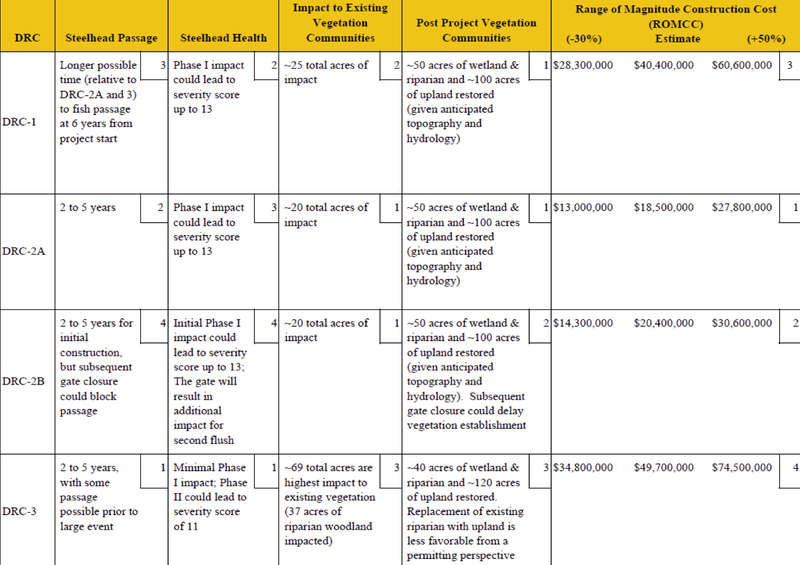 At the time of these projects, all three states at least implicitly recommended or preferred NI and non-structural solutions to coastal erosion, but the permitting process was still more cumbersome for NI than for gray infrastructure (i.e. 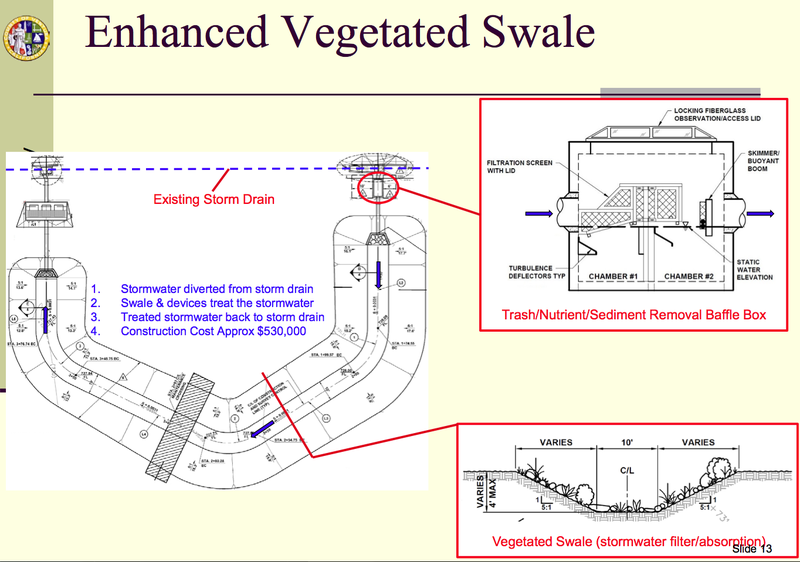 concrete seawalls) and gray infrastructure continued to be the most commonly chosen option. The researchers identified common influences on decisions to use habitats for coastal protection. In each case, "innovators" who perceived that the benefits of natural infrastructure outweighed the costs served as champions for habitat-based approach over "gray infrastructure." Common to each case was the use of visuals and trusted persons to influence decision makers. For instance, conceptual illustrations were used to communicate the approach, and licensed engineers were able to provide technical support for the new or experimental approach. The results suggest that some of the biggest policy opportunities may be at the state level, rather than the national level, and the MD Living Shoreline Protection Act provides an important model for state-level natural infrastructure policy. 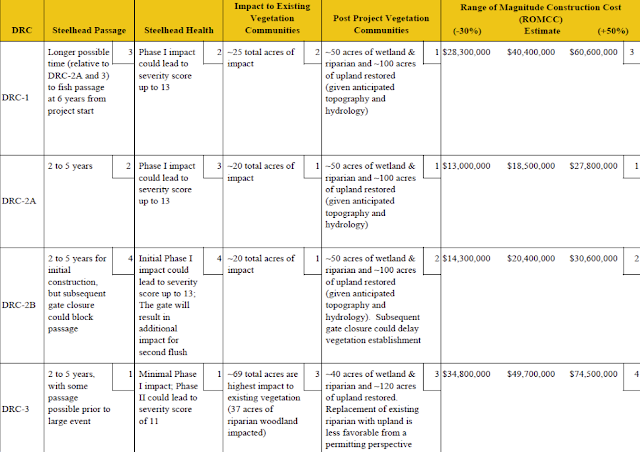 This suggests that conservation scientists and practitioners should specifically focus on replicating the MD Living Shoreline Protection Act in other states as appropriate, building the capacity of engineers and government scientists to develop standards to design and evaluate NI in order to support community decisions, and to continue to develop and deploy decision support tools such as CoastalResilience.org. 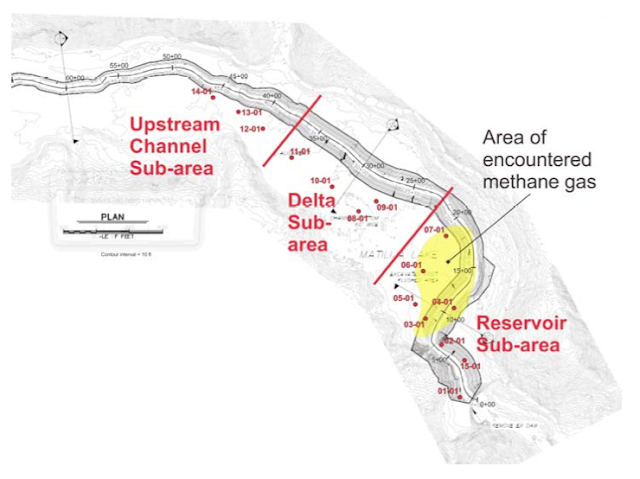 On September 17, 2015, the Matilija Dam "Design Oversight Group" met to receive a presentation from the consultant team and discuss the next steps toward removing the obsolete dam from the Ventura River. The meeting was well attended by local, state, and federal agencies and interested locals. 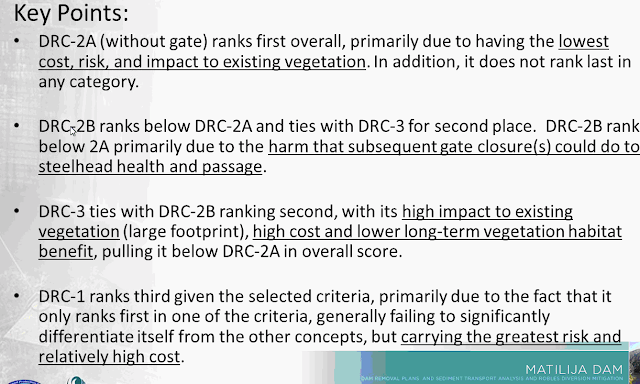 The good news: Three dam removal concepts have been developed that resolve the issues that stalled the project in 2008. Each of these alternatives greatly reduce the cost of the project and enhance the long term benefits of dam removal. These are described below. What's Next for Matilija Dam? Ventura County has solicited comments from the stakeholder organizations and government agencies that make up the Design Oversight Group. The group will meet again before the end of the year - hopefully there will be agreement on a path forward so we can take the next steps necessary to remove the dam in a reasonable time frame. 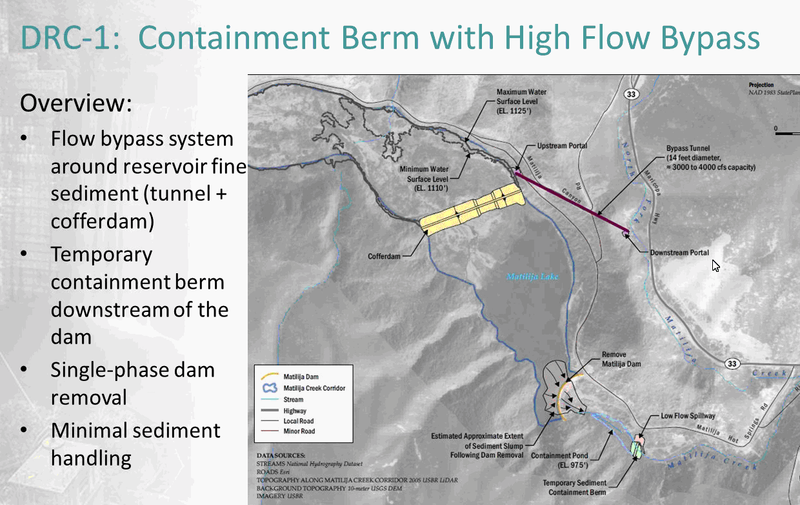 The consultants underwent an exhaustive initial screening process to consider the whole spectrum of dam removal concepts. The team ultimately agreed to carry three alternatives forward for more detailed analysis. 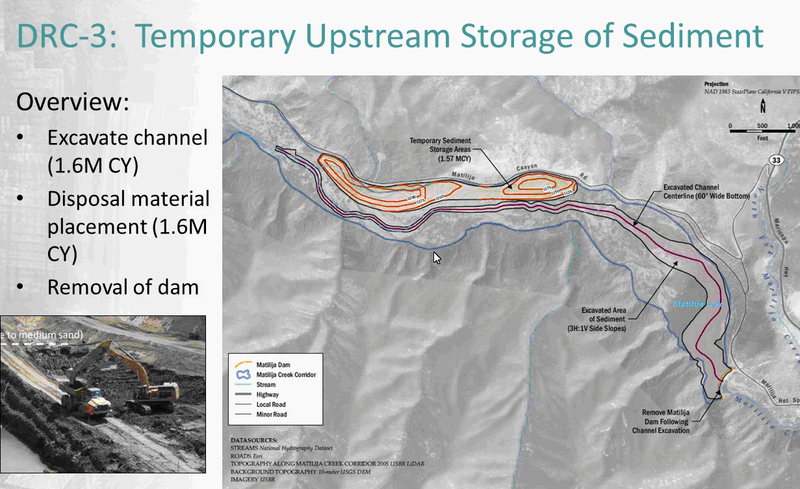 This work was presented last year at the Matilija Dam meetings May 28, 2014. The primary objective of this dam removal concept would be to use one high flow event, having a minimum average daily flow of approximately 1,700 cubic feet per second (cfs)4, to quickly erode and transport as much fine sediment and organic material as possible out of the reservoir and through the downstream reaches to the ocean. The dam would be removed by diverting the river into North Fork Matilija Creek through a tunnel in the mountain to dewater the reservoir. The next big flood to occur would then create a natural channel and flush the sediments downstream and out to the ocean. 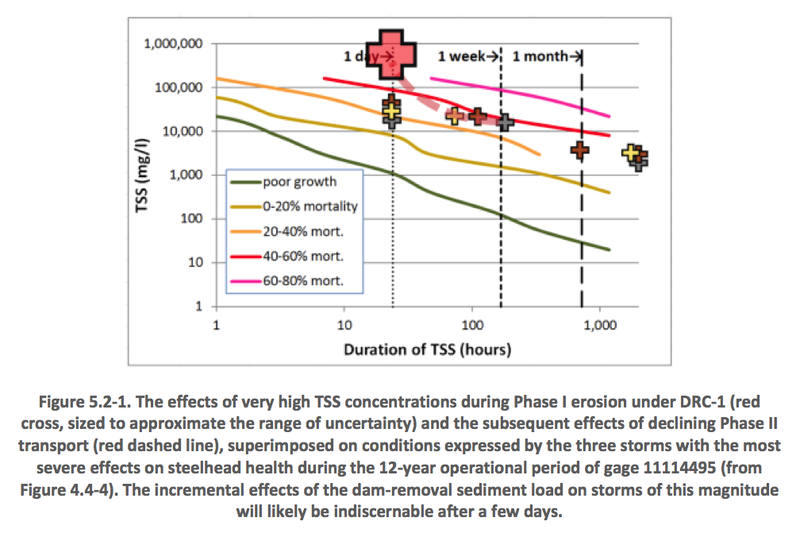 The objective of this dam removal concept (DRC-2A) would be to erode and transport as much fine sediment as possible from the reservoir, while minimizing costs and time associated with large bypass/containment structure construction and sediment removal. 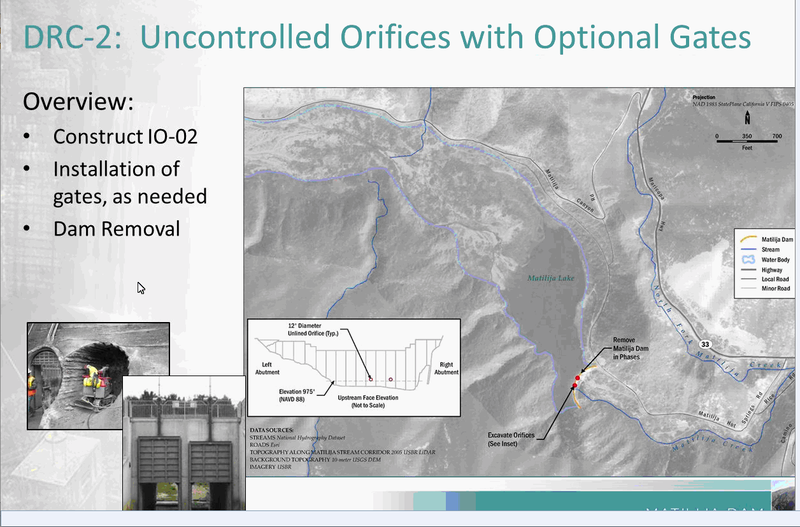 The fine sediment mobilization would be achieved by allowing flow through two uncontrolled orifices, whose opening would be coordinated to coincide with a sufficiently high flow event (as summarized for DRC-1). The orifices are sized to pass the minimum high flow event in an unpressurized condition and are located to maximize mobilization of the reservoir sub-area sediments from the upstream face of the dam. The objective of this dam removal concept is to provide a concept that optimizes the Federal project (EIS/R Alternative 4b) but reduces the volume of excavated sediment and eliminates the need for a dredge-and-slurry system. 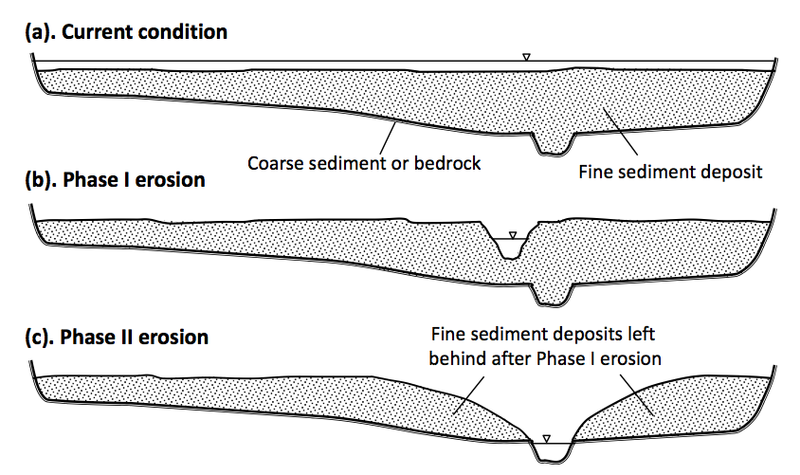 These objectives are achieved by handling and temporary stabilization of a portion of the accumulated sediment within the reservoir and allowing limited release of a portion of the accumulated sediment. The dam would be demolished and removed during the final season of channel excavation, with the goal of providing limited fish passage through the site immediately after dam removal. DRC-3 is effectively a refinement of the project developed during the Corps of Engineers Feasibility Study from 2000-2004. (see Matilija Dam poster.) The current studies were conducted because the cost of sediment management for the preferred Alternative 4b had escalated to approximately $113 million (in 2015 dollars.) The DRC-3 concept presented here reduces sediment management to approximately $49.7 million by eliminating an expensive slurry pipeline and over 70 acres of permanent downstream disposal area. 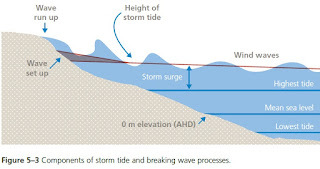 Dam removal concepts DRC-1 and DRC-2 are intended to minimize the duration and associated high turbidity impacts to downstream water diversions and ecology by concentrating the majority of fine sediment erosion and transport into a single storm event. In other words, the majority of the fine sediment would be intentionally flushed out during a single flood. 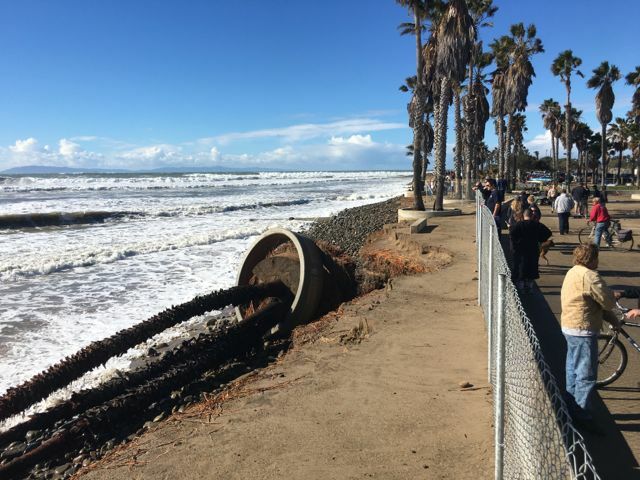 These are essentially "Natural Transport" alternatives, intended to make use of the high energy that the Ventura River exhibits during large winter storms. 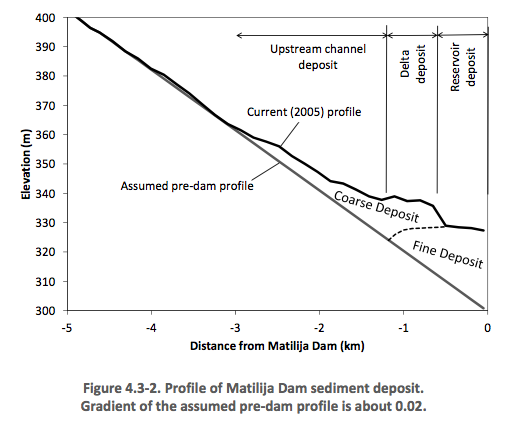 During the first high flow, Matilija Creek would cut though the sediment deposits upstream of the dam and create a channel similar to that which existed before the dam was constructed. The creek would then be constrained by the high walls on either side and much of the sediment would remain in place for many decades into the future. From an initial, unchanneled condition, “Phase I” erosion occurs as the river cuts a channel into the fine sediments in the Reservoir and Delta sub-areas. “Phase II” erosion occurs once the creek erodes down to its historic channel and fine sediment is no longer being directly mobilized by the flow. Under these dam removal scenarios, all the Phase I erosion would occur during the first flood. The analysis concludes that this event would create extremely high sediment concentrations in the river downstream and all the way out to the ocean. However, this condition would only last for about a day while the river is cutting down into the sediment. 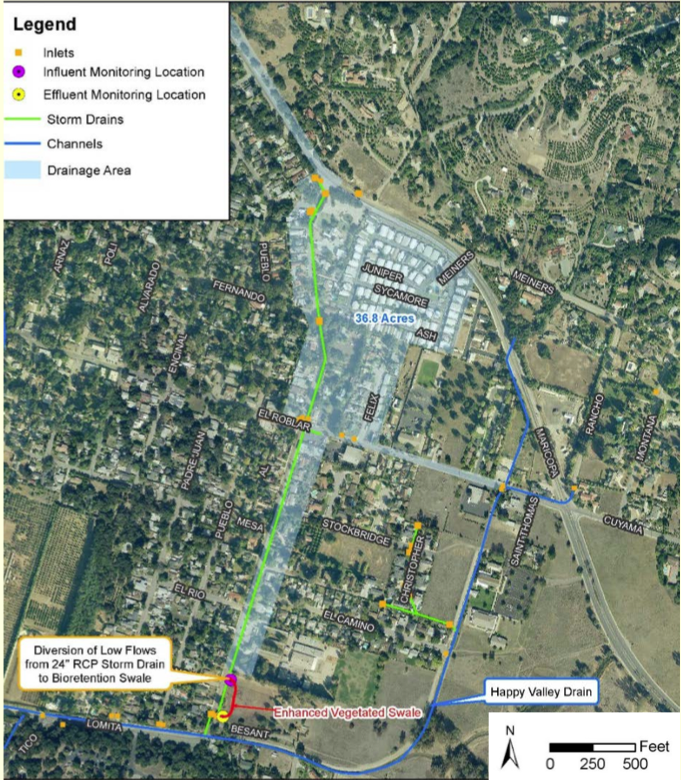 Once this channel is established, all future floods would result in Phase II conditions, in which sediment concentrations are approximately the same order of magnitude as existing conditions for flooding in the Ventura River watershed. How would this affect steelhead another aquatic life in the river? The figure below indicates severe effects, perhaps 60-80% mortality for steelhead downstream. However, other dam removal projects on the west coast have shown that, in the real world, steelhead and salmon that have been blocked by dams for generations are able to hide out in clear flowing tributaries and then almost immediately find their way upstream, sometimes within days of such an event. If you think about it, fires and floods historically created just such conditions in natural watersheds where native fish evolved. How much will the complete Dam Removal project cost? Note that these costs do not include the downstream mitigation components identified in the 2004 Feasibility Study including levees, bridges, and water supply infrastructure improvements. 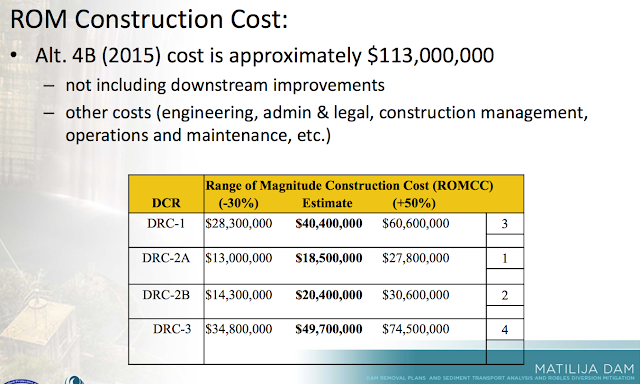 This could be an additional $50 million or more, making DRC-3 a $100 million project. 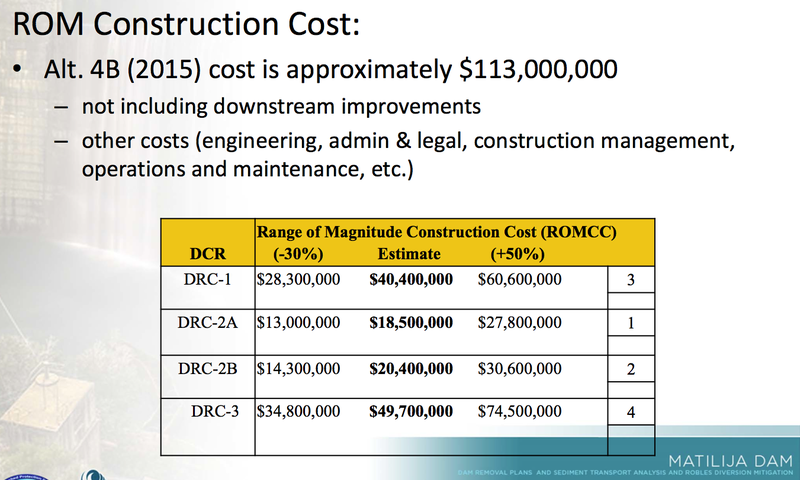 On the other hand, DRC-2 reduces sediment management to $18.5 million making it perhaps less than a $70 million project. Note that all these alternatives will require additional engineering and environmental analysis. The key to the natural transport strategy in this drought-and-flood environment is to set up the project and “wait” for a high flow event. Although the current drought seems like forever (4 years), historically we have experienced a median of two years between high flow events. Peter Sheydayi, Ventura County engineer in charge of Matilija Dam will discuss the project. KCET, the nation's largest independent public television station, is producing a series on the California Coastal Trail. Starting at the Mexican border this past winter, they are making their way north to highlight communities along the 1000 mile trail. Restoring Surfer's Point at Seaside Park: "I think if you look back in history, we've made a lot of mistakes in how we've treated the California coast," explains Paul Jenkin, member of the Surfrider Foundation of Ventura County. 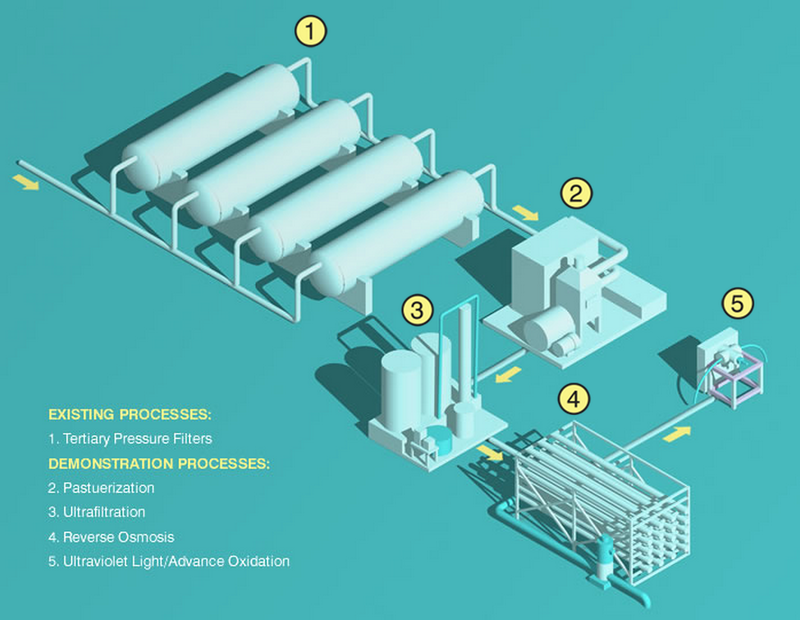 at the press event for the "Pure demonstration facility"
The components of the facility are shown below. Visit the city's sustainable water website for an interactive version of this graphic and more information. Tours are being given every Saturday from 9 to 11 am for the general public. Tours are limited to 20 people. Please sign up for the public tours before noon on the Friday before the tour by emailing Gina Dorrington (gdorrington@venturawater.net) or calling (805) 677-4131. Private groups interested in week day tours can also be accommodated with advanced notice.